Just a quick tutorial, focusing more on the colours than the process. I decided to do two variations, since there seems to be widely divergent views on what exactly the M1942 Paratrooper uniform actually looked like: this is my take on it, not gospel. For what it’s worth I used the examples here (Picture example) as my main guide. If you can get it, there are three more uniform variations in the old FOW Intelligence Briefing, ‘D-1’, so look there for alternate schemes. I've also left out reinforced patches on knees, elbows, etc., for simplicity. I start from a black undercoat, doing the netting-covered helmet first. I failed miserably to get a good set of sequence shots with this: basically I start with an overall coat of VMC Brown Violet over the helmet, wash with black, dry-brush with Brown Violet, then again with Brown Violet mixed with something lighter (here, VPA US Tankcrew Highlight). Once that netting-covered helmet is done, the base colours are painted elsewhere. The webbing (and scrim on the helmet) was painted BV as a base, then VPA US Tankcrew Uniform. Flesh VGC Tan, then Dwarf skintone. Leather items (Boots, leather straps on rifles, pistol holsters, etc) was done with VMC Flat Brown + a bit of black, wood with any dark brown and the overall uniform with Coat ‘d Arms 508 Olive Drab (or VMA Olive Grey). Metal areas black. The uniform was then painted with VPA Canvas, leather with a 1:1 mix of VMC Flat Brown and VMC Red Leather, wood with VMC Flat Earth, entrenching tool handle and bayonet scabbard with Brown Violet. Metal with VMC German Grey. Highlights were then applied, VMC London Grey to metal areas, VPA New Wood to wood. VGC Elf Flesh to flesh, VMC Red Leather to leather. Webbing was a 1:1 mix of VPA US Tankcrew Uniform and the highlight colour. 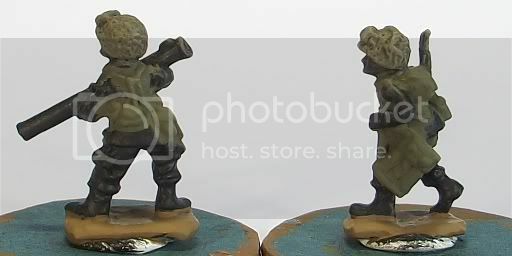 The M1942 was then highlighted with a 2:1 mix of VPA Canvas and VPA US Tankcrew Highlight. This was the colour scheme I had I my head, a ‘theoretical’ one if you will, but which when applied to a figure has one main problem for me: the lack of contrast. The colour is not ‘wrong’ to my mind, but too similar to the webbing. The result is a figure which is quite subdued and mostly Olive Drab: historical of course, but I wanted to try something else as well, hence the scheme below. Again starting from a black undercoat, I used a similar process as above. The main difference here was painting the uniform from C’dA Olive Drab to VPA Canvas, but using a different highlight colour. In this case I used the suggestion by Evan Allen on the main Flames of War site, from his article on painting US Airborne Uniforms. Here he recommends a mix of 80% VMC 882 Middlestone, 20% VMC 893 US Dark Green for the M1924 Uniform. This I used to highlight the Canvas after the initial block paint, the other colours were identical. Overall the figure looks a fair bit brighter and there is more contrast between uniform and webbing. This is not more accurate by any means, but it is more attractive on a 15mm miniature. That, to my mind, makes the miniature look ‘better’, and is now the scheme I personally prefer. Just a quick post for the Flames of War gamers. Cannedflame2005/ Foxphoenix135 has started a 'Flames of War Unofficial Blog Ring', something similar to what From The Warp does for the 40K blogging community. The collection of painting and modelling articles alone makes FTW a valuable resource, even if like me you have absolutely no interest in 40K. Something similar can only be useful to the online Flames of War community, so if you have a blog with content related to Flames of War (gaming, painting, terrain, etc.) I would urge you to have it added. Happy new year, and all that jazz...I make no apologies for the lack of posts over December: I've had better things to do than blogging. Normal intermittant posting should resume next week. As usual I got next to nothing done over the 'festive season', but I did get a air compressor and basic airbrush setup working: still much to learn on that front though. 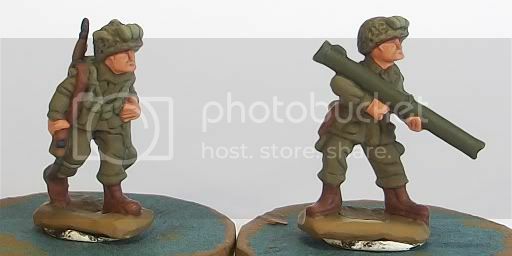 The 3rd installment of painting British infantry is still coming (note to self: make sure to have the required figures in future), plus I've also been experimenting with a few combinations for the US Para M1942 uniform, so I'll do something on that as well. After that, who knows? Apart from various Flames of War projects I have decided this will be the year I re-start my Crusades project. This was going to be in 15mm several years back, but then I lost interest in most things 'ancients' (i.e. DBM, DBMM, FOG, etc). 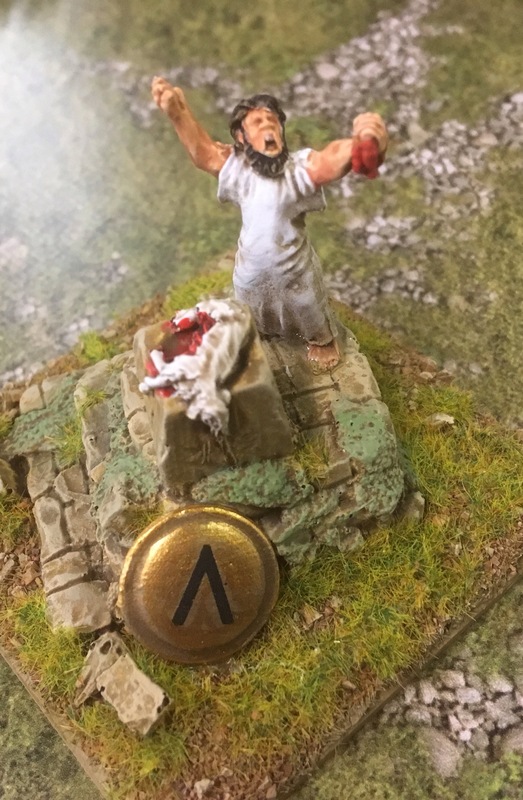 Inspired by the awesome Crusades-era battles at Olicanalad's Blog, the masses of Perry miniatures and the chronicles of 'Kermit the Hermit', I've decided to do it in 25/28mm instead. Not quite sure on the details yet, but the Crusades has been a favourite period of mine since...err, ever, actually. I feel it's high time I went back to it in some form. 28mm will obviously work out more expensive, but I think I do too much in 15mm as it is: the sheer spectacle of large formations in the larger scale simply cannot be beaten, and I am more and more looking for something that is 'game-able' and yet very visually appealing.